A Beautiful Arrangement of Imported Silk/Art. 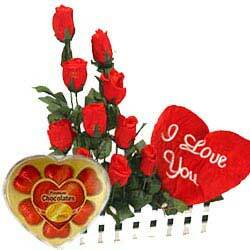 9 Red Roses, a Heart Shaped I Live You Cushion and Lovely Heart Shaped Chocolate Box. Express your Love with this unmatchable look. The Flowers and Leaves are washable and can be enjoyed for months. Order this for a long lasting memory.